Once you have completed the An Alien Concept: Weather Machines Quest and built the Snow Park your adult, teen and preteen sims can figure skate on the 4 dark patches on the ice hockey rink. TIP: if you have a swimming pool at one of your houses and place the weather machine you unlock in the quest and set it to snow your sims can ice skate on the frozen pool so you can have as many sims as you want figure skating! 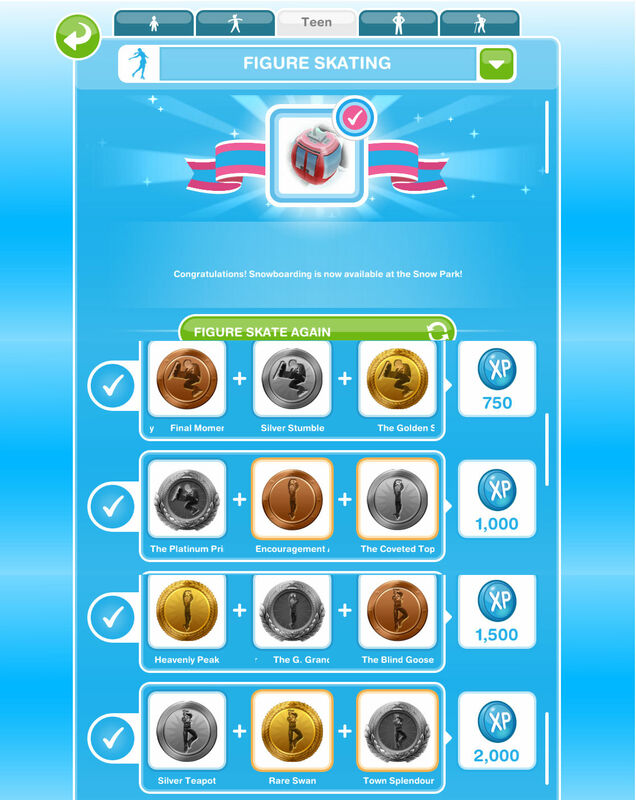 After the time has passed come back and click the exclamation mark above your sims head to find one of the figure skating medals collectibles. Every time your sim figure skates their hobby skill level up percentage will increase, once you reach 100% you will level up, there are 6 levels. You need to reach level 6 to be able to unlock all of the figure skating collectibles, once unlocked you will be able to find them. Skater Prestige Rare Swan and Simtown Splendour are now unlocked in the hobby collection. You just have to keep trying until you get it, some take longer to get than others so just keep going! After I finish skating and get a medal, the xp percent comes up and then like a icon that looks like a flame comes up and more xp points. Anyone know what this icon means? I have the same problem, I clicked on the ice and absolutely nothing pops up. Are you clicking on the dark circles? It is just me, or since the last update there is only one option: “figure skating (12h)”? Yes there is only one option now. How many sims can be ice skating at one time at the snow park? I’ve heard there is another time limited event coming up with ice skating and I want to know how many sims to train for it. Especially since ice skating is 12 hours now! Crazy! You can only have 4 sims on the ice rink at the snow park but you can have more on a frozen pool. Do you need to build the snow park before you can figure skate or can you choose to just use the weather machine to freeze the pool and then use that to complete the hobby? If I have to build it first I’ll be needing 700,000 and 18 sims. 😦 There was a notification that a new figure skating event will be released in 7 days. This is why I’m asking. I think you will be able to do it on a frozen pool at home even if you don’t have the snow park built yet. What’s the point of ssnowboarding and sleigh riding? What is the point of snowboarding and tobogganing? Are they hobbies? Is ice hockey a hobby? How many sims can figure skating at the snow park at one time? Can you figure skate at home? Yes you can, once you complete the An Alien Concept: Weather Machine quest you can set the weather machine to snow and your sims can ice skate on a frozen pool at their house! Why haven’t I found a certain medal yet? Is there a sim at the snow park? I cant get the sim town splendour, i tried and tried, anyone with the same prob ?? Figure skating seems to take such a long time these days! I can’t find the Simtown Splender either. I’ve been trying to find for it for probably 6 months now. It’s ridiculous. I’ve tried skating in all four different locations, just to see if it worked, and it still hasnt. I figure skate almost every day because I always have a sim whose life dream is that. And I STILL HAVEN’T GOTTEN IT. Some of them just take forever don’t they! Have you tried doing the lucky spin on that row to try and get that one? I cant figure skate. I press the circles and yes i do have a sim at the location. The only thing they can do is hockey or something. This might be because i do it at a neighbors town but other people seem to be able to do it just fine. 😕😕😕 any suggestions? Have you unlocked the hobby in your own town yet? Heeeeelllllppppp!!!! Ugh! Super frustrated!!!!! Ok, so i get that I must skate, skate, skate in order to get the medals. I have, LITERALLY, been skating for MONTH, to no avail! I’ve only got SIX MEDALS! And my sim is on level six out of six, I think skater prestige. So.…now what do I do?? For some reason this hobby seems to take a really long time these days, have you tried using more than one sim? If you use 4 sims you should hopefully be able to complete the collection quicker. I won the outfit but I am not seeing it in the outfit section. I checked using a teen and an adult. Any suggestions? Have you built the costume and swim store yet? You may need to do that before you can find it in your wardrobe. Hi! I have completed the figure skatingg quest and my next goal is 3lps, but i can’t find me figure skatingg costume anywhere. Must i unlock the costume shop before it show up? Yes you need to build the costume and swim store to be able to find the outfits in your wardrobe.